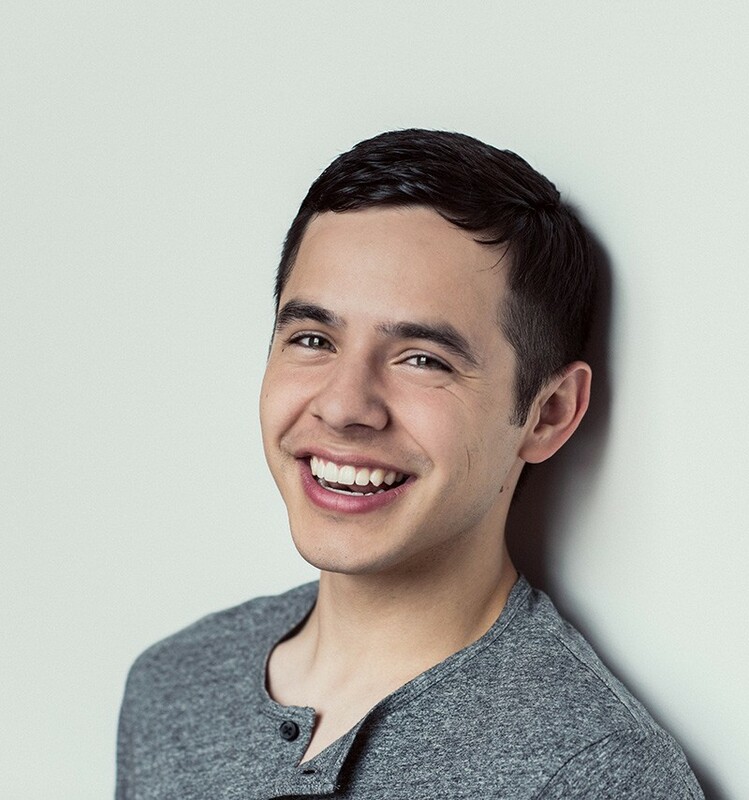 With a massive social media following (3.5 million Facebook followers, 1.3 million on Twitter and over 300K on Instagram), Archuleta has toured all over the US, Canada, Asia, and has even performed in the Middle East for the US troops. He has released his eighth studio album, Winter in the Air, and it is his second Christmas album since 2009’s Christmas from the Heart release. In support of the new release, he will kick off a month long tour beginning November 26 in Los Angeles and wrapping up on December 21 in Utah. Other cities on the trek include New York, Orlando and Nashville. Melissa Parker (Smashing Interviews Magazine): You released a Christmas album in 2009 (Christmas from the Heart), so how does Winter in the Air compare with that one? David Archuleta: For the first one, I wanted to make sure it was a reverent Christmas album. I felt like that was how I always looked at Christmas and approached it. It was called Christmas from the Heart, so I wanted to make sure it really was from the heart. With this new album, Winter in the Air, I wanted to have a little bit more fun with it, so I had some songs like “White Christmas” and “Holly Jolly Christmas,” and I tried to write a fun bouncy one myself called “Christmas Every Day” because those bring a lot of special fond memories with them as well. I just thought I’d have a little bit more fun with this one but still have some songs that are the reason for the season as well talking about Christ like “Mary, Did You Know?” and I wrote a song called “He is Born.” So this album is a mix of the two worlds. Melissa Parker (Smashing Interviews Magazine): Why did you choose the song “In the Bleak Midwinter”? David Archuleta: I love “In the Bleak Midwinter” because I feel like you can feel that frostiness. It reminds me of The Lion, the Witch and the Wardrobe or a wintry place. I heard a singer named Sissel sing it. She’s from Scandinavia. Ever since I heard her sing it, I was like, “Man, I just love, love, love that song, and I would love to do it.” So I decided to give it a shot and put it on this Christmas album. Melissa Parker (Smashing Interviews Magazine): Did you already have the idea for “Christmas Every Day” before you began the songwriting process for it and the others? David Archuleta: Yeah. I wanted to write a song for each mood of Christmastime, so I wanted the fun bouncy one. I wanted it to be like “All I Want for Christmas is You” or “Rockin’ Around the Christmas Tree.” I really enjoy those songs around Christmastime. I thought, “I don’t think I can do it, but I’ll try it anyway.” But I’m really happy with how it turned out. That was the first one, a fun bouncy song. For the second one, I wanted a more spiritual song. I wanted a song that kind of was from the influence of living in Tennessee now because I live in Nashville. I love some of the traditional, revival, spiritual songs. So I pulled from that. When I listen to it, I feel the Nashville influence of writing and song creating in “He is Born,” and I just wanted to share my testimony of what that night of Christmas really is about when the savior was born. That’s actually one of my favorites from the album because it’s so personal to me in being able to sing hallelujah to the baby Christ who is born that night. The third one was “Winter in the Air,” and I named the album after that, and I just wanted to describe winter (laughs). I know not everyone gets to experience winter. So it was kind of letting people walk through a winter wonderland. Melissa Parker (Smashing Interviews Magazine): Has your time in Nashville been more creative for you as a songwriter? David Archuleta: Oh, definitely. I love the combination of the music scene with the southern hospitality. People are so friendly here. They’re so family oriented. A lot of times, people are like, “I’ve got to finish by the afternoon so I can be home when my kids get home from school.” I feel like their priorities are where they should be. Whereas, a lot of times when I worked in LA, it was, “Do what it takes.” You’d sacrifice everything you have and love to make the most of your career. Not everyone’s like that. You’d find many people who make priorities for other things in LA as well. But the circle I was in, it wasn’t so much like that, and we’d work until really late at night. Melissa Parker (Smashing Interviews Magazine): When did you first realize that you had a talent for music? David Archuleta: I didn’t really notice that I was any good at singing. I just knew I really liked to sing. I loved how it made me feel. My parents were musicians as well. My mom sings, and my dad plays trumpet. My dad played this tenth anniversary tape of Les Miserables one time. It was a PBS special, and I just couldn’t stop watching it. As soon as it ended, I would rewind it and watch it again. As soon as it finished again, I’d watch it a third, then a fourth and a fifth time. I just loved the music. I had no idea what the story was about, but I just loved the melodies. That’s when my parents started noticing. They’d play other CDs for me, and I’d listen to those, learn those songs and sing along to them. I guess that’s where I started singing and getting better at it the more I practice. Melissa Parker (Smashing Interviews Magazine): You thought at that time of pursuing a professional career in music, or did that come later? David Archuleta: To be honest, it took a while because I was super shy. I didn’t like singing in front of people. I would get major stage fright seriously like an anxiety attack. The way that I was able to overcome it was my parents pushing me. I thought, “No. People don’t want to hear me. Why would they want to hear me? It’s not like I’m this great singer or anything.” And I wasn’t a great singer back then. It took me a while to think I was actually good at singing because I was so self-conscious, and I was so happy being to myself. But the way my parents got me to start going up and singing in front of people was they performed at this restaurant, and they said if I came and performed with them and sang a couple of songs that I would get a free meal. My parents didn’t spend a whole lot of money going out and stuff, but if I got a free quesadilla for singing, then oh yeah, I’ll do that (laughs). I was willing to overcome my fear of singing in front of people as long as I got a free quesadilla. And if I went back, I’d get another quesadilla. So it was just a good motivator for me to keep going back (laughs). Melissa Parker (Smashing Interviews Magazine): What was your favorite song or performance of all the ones you’ve done on the various musical talent shows throughout the years? David Archuleta: I guess for different reasons, there was one to see how people reacted and another one was just personally. With American Idol, I sang “Imagine.” I love that song, and I sang the third verse, but I didn’t realize it would impact so many people. I didn’t try to make it huge. I didn’t try to make it a spectacle. I just wanted to help people feel something special. As a 16-year-old, I didn’t think I would get far on the show. I wasn’t competitive, but I thought that if I could help people feel a special spirit, then I had accomplished what I wanted to accomplish. I didn’t think it would be a good competitive move like a lot of people thought. I’m just glad that so many people were impacted by that performance. Then I loved singing “Smokey Mountain Memories” on that show because just personally it reminded me of my folks back home in Utah. While it wasn’t the Smokey Mountains, I had the Rocky Mountains. I was really close to a lot of my neighbors. I wasn’t social. I didn’t have a lot of friends my age, but I loved going and visiting my neighbors who were widows. I remember some of them like Mrs. Higby or Mrs. Mandarino and going over and rollerblading to their houses just talking with them and hearing about their grandkids. Going from a nice little neighborhood to being with millions of people was a little overwhelming. But it was Dolly Parton week. So for Dolly Parton to write a song that I could connect with so much … it was therapeutic to sing it and know it was okay to miss home. Singing about it helped me and motivated me to keep going. That was a special moment for me. Melissa Parker (Smashing Interviews Magazine): What can fans expect from the Winter in the Air tour? David Archuleta: I got an old microphone just to give it a throwback. Not all of the songs are a classic 50s style, but there are a few that I made with those arrangements with just a little throwback because to me, Christmas is about memories that we have from when we were younger. When I think of classic Christmas, I think of Nat King Cole and Bing Crosby, so I thought it would be fun to try and follow a little bit in their footsteps and also Michael Buble. He’s modern but still classic Christmas. I’ll have a lot of fun trying that approach. Of course, I want people to come, and I want them to feel those memories. I want them to make good memories and feel like they can sit back and relax and feel some peace through Christmas songs and also make some fun memories as well. Melissa Parker (Smashing Interviews Magazine): Other than music, what fills your days? David Archuleta: Well, I don’t know. On Tuesdays, I volunteer at the Food Bank. One of the kids was like, “What do you do? Do you play sports? Do you watch sports? Do you go fishing?” I’m like, “No. I don’t know. I come to the Food Bank.” (laughs) He said, “Well, you lead sort of a boring life.” I said, “Well, I do travel, so I kind of want a little boring now and then.” But I do like going out to restaurants. I don’t know. I guess I am sort of a boring person. Melissa Parker (Smashing Interviews Magazine): You are anything but boring, David, and thanks for giving back. Appreciate your time today. Excellent interview Melissa (and David). I really enjoyed reading about what you love about Nashville and the people there. I also liked learning more about writing your new album, and about your volunteer days at the food ban, too. Great questions and very thoughtful answers. :)Thank you! This guy is so impressing! I enjoyed when he sang Shout to the Lord also with the group. We followed him the whole season. I think this young man got himself in order. He seems very evangelical and in the recent concerts I have seen on the internet he could even be a great Evangelical youth pastor. Go for it David. Actually, I would love to hear a beautiful CD of HYMNS from David. I heard him singing one at a church on the internet after he returned from Chile. It was heavenly. Give us a nice hymn album David.